Does gifted education curriculum help talented students go ahead faster? More than half the gifted students in the three states were white. In one of the three states, almost three-quarters of the gifted students were white even though they made up roughly half the population. In that same state, blacks made up a quarter of the population but had fewer than 10% of the gifted seats. Hispanics had 7% of the gifted seats and made up 16% of the population. It’s important to point out that the researchers only surveyed schools and district administrators; they didn’t actually analyze the content or quality of gifted curriculum. Still, it’s revealing that three-quarters of the schools admit that they don’t use a separate curriculum especially designed for gifted students in reading or math. Without a curriculum, teachers are making their own decisions about what to teach. One classroom in one school might be offering a very different education than another gifted classroom down the hall. Researchers found a wide variation in how schools teach gifted students. Within each state, roughly half the schools put gifted students together in separate classrooms. Other schools pull students out of their regular classrooms for a few hours a week of gifted instruction. Other times, a teacher is sent into classrooms to work with gifted students. A fourth common approach is to create small groups within a class, clustering gifted kids together for many assignments. Most schools used a combination of the four approaches, but researchers didn’t find one approach worked better than the others. Achievement gains were similar regardless. The researchers say their survey is evidence of a “disconnect” between who gets labeled “gifted” and how these students are actually getting taught in American classrooms. They point out that the kids are being selected for these programs because they have high math and reading scores yet they’re not given much advanced instruction in either subject. Sluggish learning for the brightest Americans may be the consequence. The researchers also tracked the annual state test scores for more than 350,000 students in these three states who started third grade in 2011. Gifted students, on average, began third grade with academic achievement two grade levels above the academic level of non-gifted students but posted slower academic growth than general education students between third and fifth grades. Other studies have also found slower growth for advanced students during the school year. However, it doesn’t seem that gifted education is entirely useless. High achieving kids who weren’t identified for gifted services but still scored above the median score for gifted students on the third grade test had even slower academic growth than students in the gifted programs. So perhaps these critical thinking and creativity exercises are doing something. 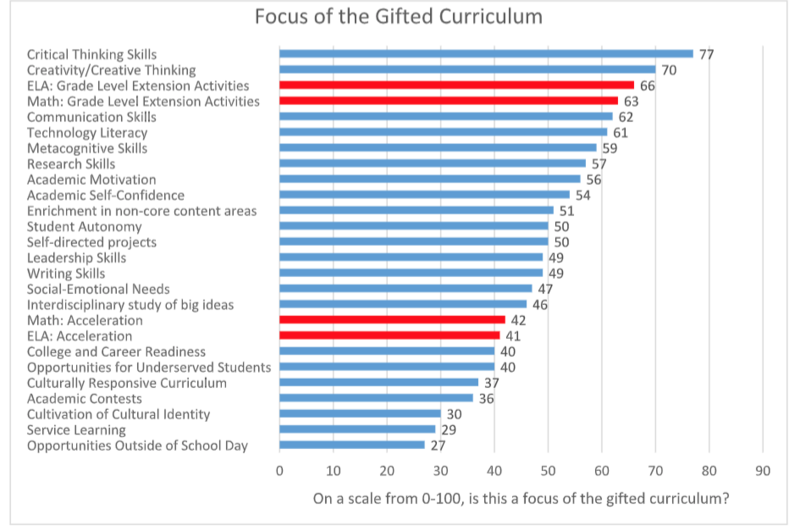 This research points to the lack of consensus on what the goals of gifted education should be. Many don’t think it should be about advancing students as quickly as possible. High quality instruction that helps kids who’ve already mastered the basics go deeper into the material may ultimately be beneficial. And annual state assessments may not do a good job of measuring this kind of depth, creativity or critical thinking. Why do schools tend to ignore this research evidence? McCoach speculates that many educators are worried that students who race ahead will face social problems at school, even though, she says, there is no research to support this widely held belief. State testing itself might also discourage school leaders from changing the curriculum for gifted children. Gifted kids tend to score at the top, propping up school ratings and rankings; there’s a fear that even bright kids might do worse on grade-level material emphasized on the test if they are spending most of their time on future topics. “Gifted students are the ringers for the state tests,” said McCoach. School leaders “don’t want to be shooting themselves in the foot,” she added. I hope this study calms anxious parents who worry that their kids will miss out on a great education if they don’t get into a gifted program. And for education policy officials, it’s worth revisiting what the point of gifted education is, especially when the students are disproportionately white. 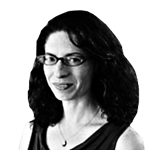 In the future, McCoach and her colleagues plan to study how gifted programs increase racial segregation. In the meantime, the debate over gifted education continues. 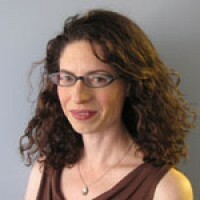 This story about gifted education curriculum was written by Jill Barshay and produced by The Hechinger Report, a nonprofit, independent news organization focused on inequality and innovation in education. Sign up for the Hechinger newsletter. Very interesting article. What I find upsetting is that the researchers dont disclose the 3 states and areas in the state that were used in the research. Those factors are very important especially when it comes to race demographic also when it comes to the ranking of the state on the education rankings in the US.